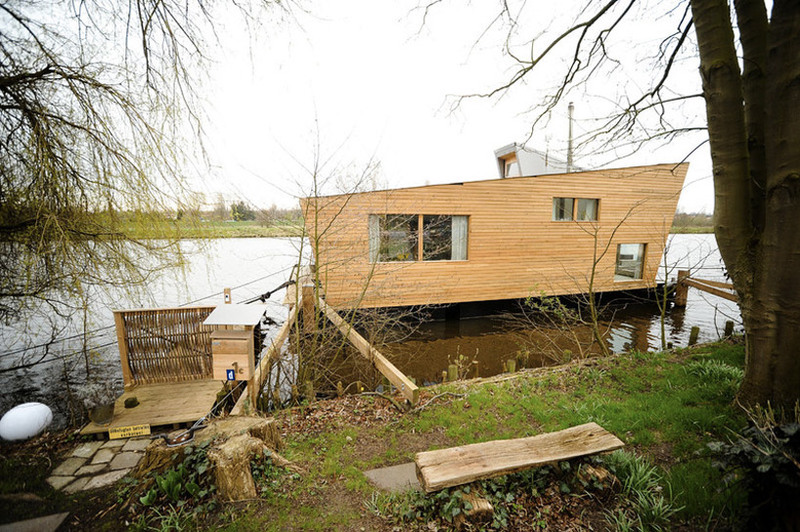 the ‘hausboot silverbeaver’ is a small dwelling floating on the hunte river in oldenburg germany, by german product design and architectural practice confused-direction design. their second iteration of a home sited on water, the wooden construct integrates into the surrounding wooded landscape. room arrangements, materials and textures combine to generate clear, warm and bright spaces. a single pitch roof is permeated with a dormer which welcomes daylight into the lofted bedroom which is accessed with a ladder stair. accessible from the living spaces through an inclined glass exterior wall, a terrace offers views of the scenery during the changing seasons. the smallest of inhabitants, the pet cats have bedrooms integrated into the common spaces to be part of family events. a centrally located bullerjan oven heats the interior through a method of convection of heated air. clad with locally sourced larch-wood, the boathouse introduces high-tech materials for floor surfaces as well as insulated windows. do you have to own a land to build a house there? it’s gorgeous!!!!! i love the architecture!! 2 years ago i build my one houseboat, and yes you need a place to stay, land or place. But when i see this.. it’s beautifull. 10 times better than Dok12 (big multilevel square box aka HouseBoat). Have somebody know the name of the chair that looks like an egg? are plans available for houseboat? what is the name of flooring material?